GamePad Companion enables you to configure your gaming device to act as a keyboard or mouse. With GamePad Companion you can use your gaming devices with most games and apps, even if they don't have built-in support for those devices! 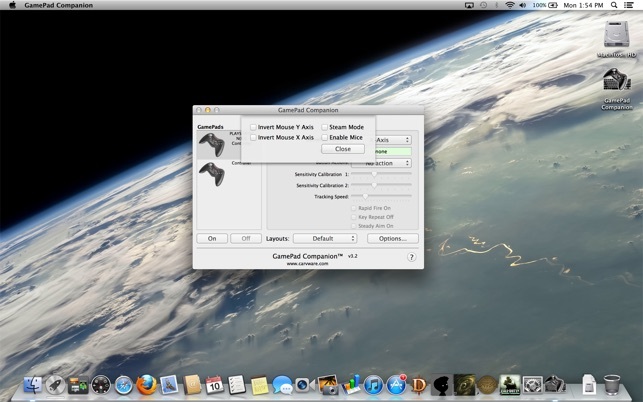 GamePad Companion works with gaming devices that conform to the USB HID (Human Interface Device) standard. For more information on devices you can visit GamePad Companion support. *Some gamepads may require drivers not built into OSX before they will appear in GamePad Companion. *Please visit www.carvware.com for important information regarding XBOX 360 and PS3 gamepad support.